Fun Crossword Puzzle for Kids About Animals! You're sure to enjoy this crossword puzzle for kids! Even if your child is too young to know how to spell all the animal words, you can work together to successfully complete this crossword. 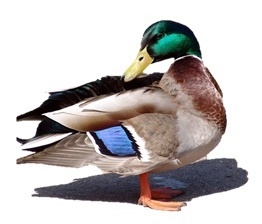 Think about the sounds that different animals make. Then read through the clues. It's extra-fun and even helpful to say each sound aloud. Then fill in the name of the animal that makes the sound given in each clue. Here's a peek at the printable version. The clues also appear below in full-size text for your convenience. Do you know what we call the sound an elephant makes?? ?Scroll down to the orange button for the answer! Try Another Crossword Puzzle for Kids! Disney Crossword Puzzles One of our most popular kids' crosswords! Supply the names of some major characters from several Walt Disney stories and movies. Let's Eat! Can you can figure out the clues to some of these common foods? 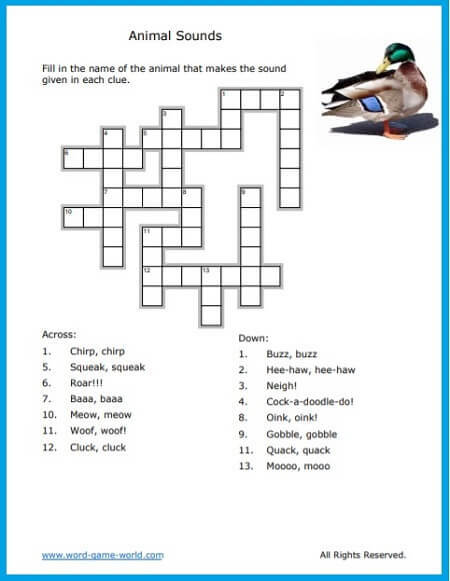 Animal Crossword Puzzles Here's another crossword puzzle for kids about animals! This time, supply the names we use to describe different baby animals. Calendar Crossword Do you know all the words (and correct spellings) for these terms from the calendar? Rhyme Time Crossword Puzzle Here's a fun crossword for young children to enjoy as they complete the sentences with words that rhyme. Body Part Scramble One of our easiest puzzles for early learners or ESL students. We give you all the letters for each answer, but you need to put them in the right order to spell a part of the body. The elephant's sound is called a trumpet. Spanish Crossword Puzzle What a great way to practice basic Spanish words! Math Crossword Puzzle If you're good with addition and subtraction facts, this puzzle will be a breeze! Science Crossword Puzzles Try out this astronomy crossword to see how much you know about the planets. Please visit my other website, www.spelling-words-well.com, for a whole new collection of printable crossword puzzles for kids! While you're here at Word-Game-World, why not try some of these word search puzzles? They also provide FUN word play! Double-Letter Animals This one "otter" be a lot of fun! Let's Laugh Fun words, easy for beginners. Be sure to see our entire collection!